Twitter continues to deny its liberal bias despite its shadow banning and silencing of conservative voices on its platform. The flamingly liberal Facebook did not return requests for comment, hiding behind Zuckerberg’s, “Senator, I’ll have my team get back to you” line. Google grotesquely denies that its search engine results prioritize anti-Trump news articles and restrict conservative publications from the world’s number one internet search company with 72.5 percent of the world’s market share. Paula Bolyard of PJ Media, the source of Trump’s 96 percent reference, went out to test the premise that Google censors and hides conservative news on its search engine. What she found confirmed what we have all known for some time. They are silencing conservative viewpoints and elevating liberal news outlets to craft their own narrative and deceive the American public. On the first page of search results for “Trump news,” no surprise, CNN was at the top with two of the first ten search results. Other liberal rags like CBS, The Atlantic, The New Yorker, Politico, Reuters, and USA Today were also on the first page (though Reuters and USA Today are admittedly closer to the center). “Not a single right-leaning site appeared on the first page of search results,” Bolyard writes. But it gets worse. After she analyzed the first 100 items Google returned from her search for “Trump news,” CNN appeared most frequently with almost twice as many results as The Washington Post, which came in at second. Only The Wall Street Journal (3) and Fox News (2) had results in the top 100. No other conservative-leaning sites were listed outside of these two. Left-leaning sites comprised of 96 percent of the results. Here are the sites that appeared most frequently in the top 100 results for Bolyard. Bolyard performed the search many times using different computers registered to different people and Google still returned similar results. While she admits the level of research she performed is by no means scientific, it nevertheless strongly suggests a bias against conservative content. Google regularly tweaks its secretive algorithm and a website’s daily readers can rise or fall depending on these changes. PJ Media, for example, fell off of Google users’ radars after a May 2017 change to the algorithm and have yet to recover the lost traffic. Other conservative and alternative news sites, like Investment Watch Blog, have reported similar declines in traffic as Facebook, Google, and Twitter continue to censor a point of view they find detestable. And whatever you think about Alex Jones, his removal from YouTube, Facebook, and Apple earlier this month was a frightening attack on free speech during these discouraging times. Google and social media are a politically correct utopian liberal monopoly and they are controlling what information Americans can see. This has to stop and Trump appears more than willing to go after them. This is a very important topic this week as Google, Facebook, and Twitter are all scheduled to testify before Congress next week to discuss censorship and election meddling. Facebook will be summoned to Capitol Hill for the third time in recent months and Google and Twitter will be going for its second. Facebook’s COO Sheryl Sandberg and Twitter CEO Jack Dorsey are confirmed to be attending the hearings. How could Trump hurt Google? Antitrust officials in Washington could investigate whether the Mountain View-based company is abusing its market dominance and using its internet search monopoly to suppress certain websites. Republican Congressmen could keep bringing the tech companies’ executives to Washington for more uncomfortable, high-profile hearings, and bad publicity. Or Trump’s accelerating attacks on Google could paint them as a partisan company and which could result in a loss of a sizable chunk of the conservative half of the country, forcing the company to make a financial decision to be more open to adopting a fair and balanced algorithm that lists all points of view. President Trump warns Google, Twitter and Facebook, they are treading on very troubled territory. Larry Kudlow, Trump’s economic advisor, suggested on Tuesday that they are considering some form of regulation for Google following recent calls from Texas Senator Ted Cruz and former Trump ally Steve Bannon to regulate the search giant like a utility. “We are a political monoculture that’s intolerant of different views,” wrote Brian Amerige, a senior Facebook engineer. “We claim to welcome all perspectives, but are quick to attack — often in mobs — anyone who presents a view that appears to be in opposition to left-leaning ideology.” More than 100 Facebook employees have joined Amerige to form FB’ers for Political Diversity, but this is still a miniscule portion of the company’s 25,000 employee workforce. Several Facebook employees have voiced concern over decisions to ban certain accounts while allowing other controversial people to stay on the site. See Alex Jones. A senior engineer at Facebook wrote an internal message about what he calls the company’s “monoculture.” Anyone who is not a flaming liberal, like Democratic donors Mr. Zuckerberg and Ms. Sandberg, is pushed out or stripped of their voice. Palmer Luckey, founder of Oculus, recently acquired by Facebook, was pressured to leave the company last year, after news came out of his donations to an organization spreading anti-Hillary Clinton internet memes. Twitter has long been a forum for free and open expression, allowing all ideas and perspectives to be shared no matter one’s ideology. But CEO Jack Dorsey has since changed his tune by cracking down on certain users on his platform. He is aggressively banning certain accounts while his history of shadowbanning has been well documented. All of this, of course, is framed in the Russia is meddling in our elections narrative. The Project Veritas video above posted in January proves beyond a reasonable doubt that Twitter engages in shadowbanning of conservative voices. Below are some revelations unearthed by the one-of-a-kind undercover investigative journalist, James O’Keefe. By the way, everyone should read his January-released book, American Pravda: My Fight for Truth in the Era of Fake News. Steven Pierre, an engineer at Twitter, explained shadowbanning as banning “a way of talking.” Former Twitter software engineer Abhinav Vadrevu described shadowbanning as a user thinking “that no one is engaging with their content, when in reality, no one is seeing it.” Makes me wonder if I have been or if I am shadowbanned! Mo Norai, a former Twitter Content Review Agent, explained the banning process as, “if it was a pro-Trump thing and I’m anti-Trump… I banned his whole account… it’s at your discretion.” He went on to add that there are “a lot of unwritten rules… it was never written it was more said.” Well, there you have it. Still not convinced Twitter shadowbans? Censorship of certain political viewpoints can also be automated by “machine learning,” said another software engineer. 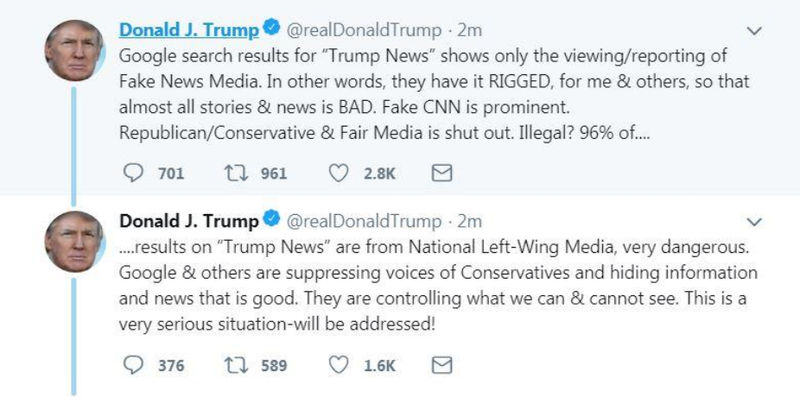 The real enemy of the people is social media and Google. Believe me. If this article did not convince you of that, then you’re probably a liberal. Good luck in November after Trump starts to regulate your heroic allies in Silicon Valley!